Let me sum up the last few months or so. We started the stair project after deciding that the carpet was nastiness and we didn't want to deal with nastiness again. And no the stairs are not quite finished yet...but someday they will be. Once we started in on the stairs and got to looking at the rest of the carpet, we had many lengthy discussions about our hallway, loft and the kids' bedrooms upstairs. We finally decided to put in some nice laminate wood flooring in all of the previously mentioned spaces for mainly one reason... kids are not the cleanest creatures in the world. 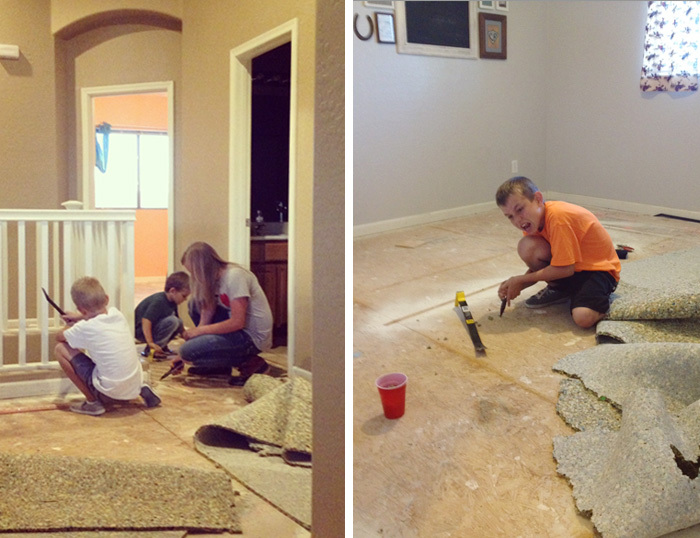 We shopped around for flooring and found a great deal at Home Depot and a sale on installation. Eureka! So we straightaway ordered a nice thick laminate wood. Also, flooring doesn't magically appear one day...I found out. It takes soooo many steps, especially if you are currently living in the area and have any kind of furniture at all. Also, I only took iPhone photos of the adventure, but it is better than nothing. First up we had to pick up the flooring and haul it in the house to acclimate for a few days. 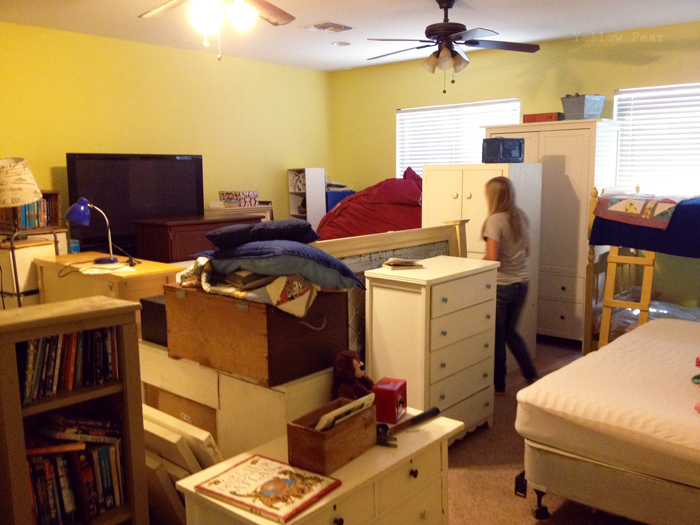 Then we had to remove the furniture out of three bedrooms and a loft. Luckily we have a giant bonus room, so we shoved all the kids in there for what we thought would be a week and a half or so (that's foreshadowing). Next we gathered the kids, crowbars, gloves, hammers, and pliers and removed all of the baseboards, carpet, pad, tack strips and staples in three rooms, a hall and a loft. It took a LONG time. Mr. C and I removed soo many staples. I practically crippled my right hand. Then we had to sweep and vacuum the mess. 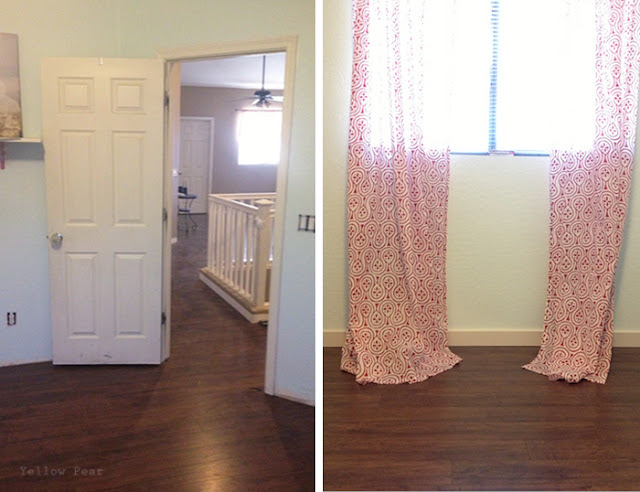 Oh and we also decided (for funsies because we weren't busy at all) to paint both Miss B and Mr. C's room whilst the flooring and baseboards were out. Finally it was time for the installers to magically lay the flooring. HOWEVER. When they showed up, they got to measuring and such and told me the floor wasn't level. I said, Oh. And they looked at me and I looked at them. And then I got this feeling like they wanted me to do something about it. So that was awkward. And then I sent them home until we could somehow figure out how to level the sub floor. But I wanted my floors in. And I was so bummed and disheartened with four children and all of their belongings in one giant room and no end in sight. So I painted my front door while I waited. Luckily my handy and helpful brother-in-law was coming to town in the next couple of weeks so there was nothing to do but wait for him to help us figure out which way to go next. He is more savvy in the home-building area than we are. So when my brother-in-law finally arrived, he and my hubby rented a floor sander and sanded the high parts of the sub floor. Then they bought some leveling compound (cement type stuff) and leveled out the low spots as best they could and then sanded some more. You can imagine the dust that settled over my home and all of my belongings...but it was grand because we had progress. Then we rescheduled the installation. And double checked the leveling and fixed one last spot. That's when the miracle happened. The glorious installers came (a different team than the first time) and were angels and fixed everything, even the un-level spots we missed and they finished the bull nose edges on my stairs and they showed me some tricks for the detail work and they complimented me on our fine stair job. They cleaned up and were courteous and so helpful. I baked them cookies both days they were there. They were angels I tell you. And then finally, FINALLY, my hubby and I have begun the baseboard work. We have finished 2 1/2 rooms and I'm pretty proud of our first baseboard work. I have caulked and painted the finished baseboards and we moved Miss B back into her new space (they ended up being in the same room for about a month). We will continue to finish baseboards and move kids back. 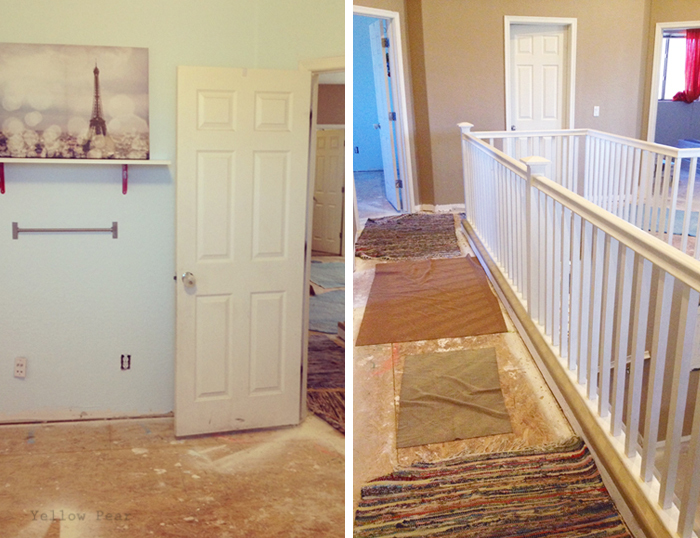 Then we can maybe get around to finishing the stairs and get new carpet installed in a few rooms. It's pretty much never ending. But it's looking quite lovely. Although there are chaotic and nightmarish messes to be dealt with until we can truly call it lovely. I retract my previous wonderments over you living a charmed life. A non-level floor?? Great Scott! I'm glad the 2nd team of installers had a clue. Jeesh! What a deal.